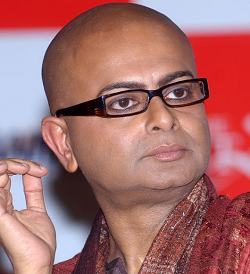 Recently the Directorate of Film Festival, GOI organized a retrospective of late Rituparno Ghosh at Siri Fort Auditorium, New Delhi from Aug 2-4. About ten of his films were screened as part of the homage. I and my wife managed to catch a couple in this package, which we hadn’t seen earlier. The first, The Last Lear (2007) featured Amitabh Bachchan, Priety Zinta, Arjun Rampal, Jishu Sengupta, Prasenjit and others. Made in English, it is about a Shakespearean Theatre actor and his experiences during the making of his first film where he enacts a clown. The film has its flaws and the plot at times falters, but it is Amitabh who carries the film singularly on his shoulders. He is not the archetypal theatre artiste, but he manages to exude the aura of a seasoned Shakespearean actor. His ability to transform himself to a decadent old actor who is caught in a time warp is exemplary. He is clearly the film’s Last Lear and lives up to it. Though Rituparno tried to bring in the feminist angle where men are almost always depraved and women the hapless victims, it fails to cut ice with the audience. The second, Bariwali (2000) deals with the loneliness of a widowed house owner Banalata (Kiron Kherr) who lives alone in a huge feudal house with her maid and her Man Friday. Their routine existence receives a jolt when a filmmaker (Chiranjeet) comes to shoot a film in that building. This is RG on familiar turf delving beautifully into the mind of the female protagonist. The supporting cast includes Roopa Ganguly and Abhishek Chaterjee. In my view, RG was a true inheritor of the Satyajit Ray and Tapan Sinha brand of filmmaking, where we usually found fine story-telling with the unfolding of the narrative. RG was in a hurry. Did he have some kind of premonition about his death? ... He made 19 feature films and a few documentaries in a career spanning just two decades. Quite prolific I would say.